If you ever happen to be in Mumbai over the weekend, you should take to the street post 10 PM in the night. The streets are filled with vendors in certain pockets that would make you wonder the appetite people carry at that hour of the night. But then street food along with being fast, junk and easy to carry is also about crazy timings. They dont necessarily fit into the regular routine of meals and also they do not rationalize themselves on the health meter. One such food that is relished is the tawa pulav. It is to cater to the rice loving people who often tag along with families to eat pav bhaji. I think it was this thought that invented this beautiful recipe. It has copious amounts of butter added probably as much as the rice, it is bound to taste good. The vendors often put up boards of the butter brand to assure that they have the best deal. 2)In a large wok/kadhai, heat oil or butter, add the onions and saute until they are soft and pink. 5) After 2 min, open the lid and saute further. At this stage the vegetables should be cooked, you can use the pav bhaji masher to lightly mash the vegetables.
) There should be enough oil or butter on the sides of the pan by now. If not, you may want to add more. 7) Add the cooked rice and gently fold it in taking care not to break the grains. The rice should be well coated with oil and vegetable mixture. very very delicious tawa puloa dear :) so perfectly made .. they are really making me hungry now !! Brings back beautiful memories of all the crazy things we did..love that tawa pulao minus the excess butter. Dont talk about BM25 Pradnya, seriously am jealous. Wish i live in India to meet u all..
Tawa pulao looks extremely fantabulous and my kind of one pot meal. Lovely tawa pulao. Indeed it is very famous street food. I think we have some sort of connection while choosing the recipes. Tawa pulav looks superb !! Oh! Such a nostalgic post. Wish I were with you guys too... Lovely and am yet to taste this much appreciated dish. wow - so flavorful - I have to try this one! I really missed that 1st day street food! I have the pics that Kamalika shared . You have brought back all those wonderful memories. Btw, this is my fav too..
Wow looks too good to pass!! 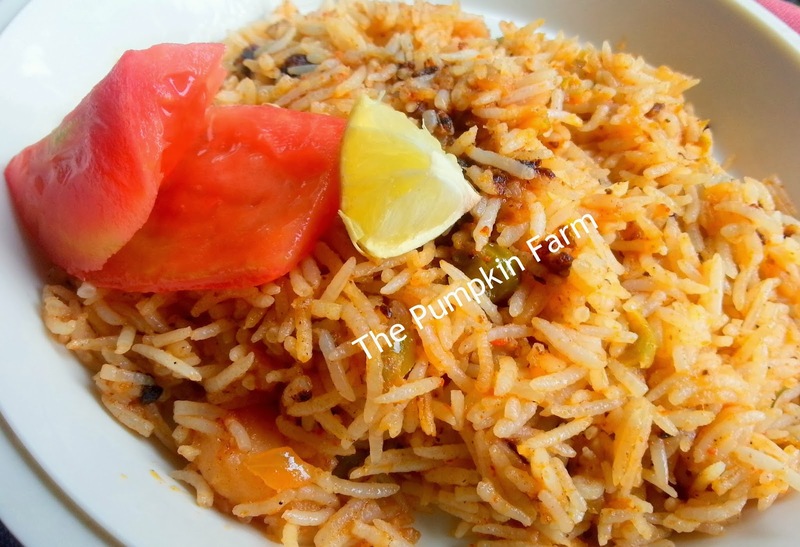 Delicious looking tawa pulao. Copious amounts of butter or not, this is a tempting dish. 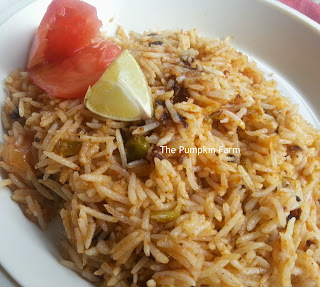 very delicious tawa pulav...looks very tempting!! I remember the race to see the pulav being cooked Pradnya. Wow what beautiful days those were. Thanks you brought back memeories of the yum time I had with like mined people.